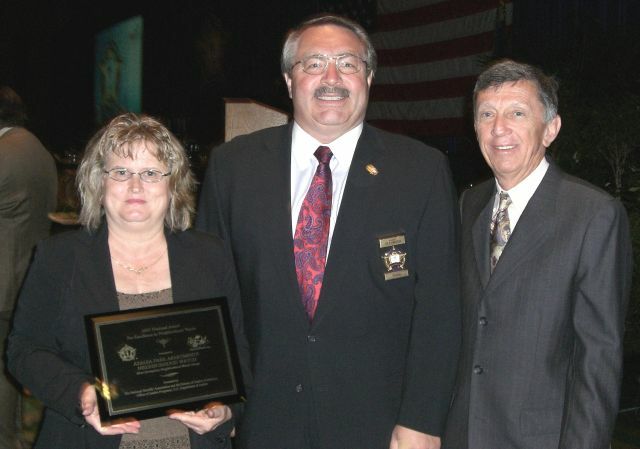 For 35 years the National Sheriffs’ Association has provided law enforcement and community groups with the National Neighborhood Watch program in order to build safer and stronger communities. Over the past 5 years with support from the Bureau of Justice Assistance, Office of Justice Programs, U.S. Department of Justice USAonWatch has revitalized neighborhood watch programs across the country. Every year NSA and BJA honor law enforcement agencies and neighborhood watch groups with exceptional programs. 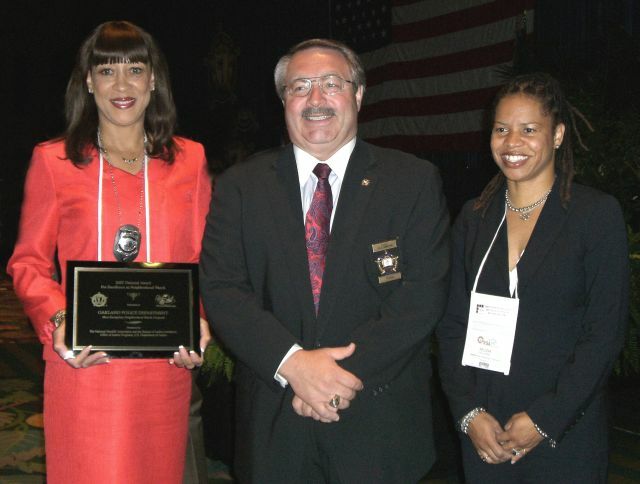 On June 26, 2007 the National Sheriffs’ Association in partnership with the Bureau of Justice Assistance, Office of Justice Programs, U.S. Department of Justice presented the 4th Annual National Neighborhood Watch Awards of Excellence. This year NSA USAonWatch recognizes two law enforcement agencies and one neighborhood watch group doing extraordinary things to promote Neighborhood Watch in their communities. The Orange County Sheriff’s Office has one of the largest active Neighborhood Watch programs in the country. The South Orange Crime Prevention Unit has developed many innovative programs to keep all residents of Orange County safe. Some of these programs include a Parent Watch Program to monitor youth activities at local shopping centers and movie theaters, an email notifications program to notify residents quickly of criminal activity, and most recently an educational program to provide Neighborhood Watch members with the skills to identify and safely report gang activity. There are over 1200 Neighborhood Watch groups in the county and the Sheriff’s staff is constantly working to maintain and increase these numbers. Over the past year, Orange County has implemented the NSA’s Neighborhood Watch Toolkit Training. Orange County hosted training for law enforcement in Southern California and Director of Crime Prevention Jan Sener is an active member of the California Citizen Corps team which is working to implement the Neighborhood Watch Toolkit across the state. 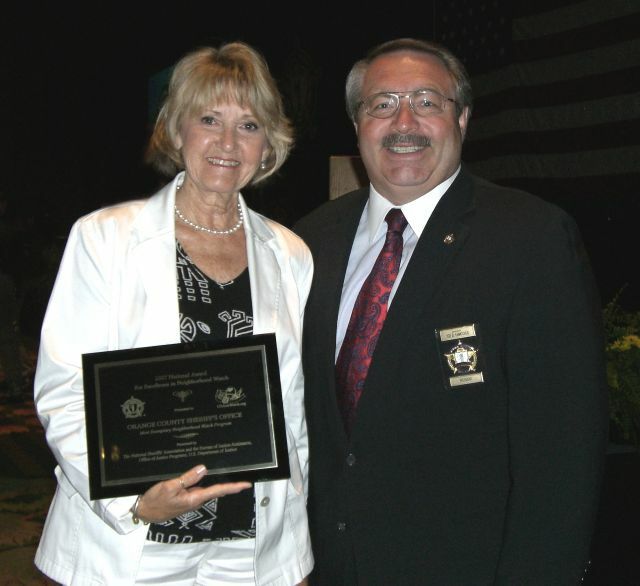 The Orange County Sheriff’s Office is a model for effective and creative Neighborhood Watch programs and the National Sheriffs’ Association proudly presents Sheriff Michael Carona and the Orange County Sheriff’s Office with the 2007 Neighborhood Watch Award of Excellence. In an effort to decrease violent crime in the City of Oakland, in 2005 the City Council voted to revitalize the Neighborhood Watch program and developed a mission statement to direct the police department. The Oakland Police Department has taken this challenge to task by using the city’s mission to create goals and over the past two years Oakland has seen a substantial increase in the number and strength of Neighborhood Watch groups. The first goal is to maintain 3000 active Neighborhood Watch groups by 2017. With ten years left to complete this goal, Oakland has started strongly by increasing the number of Neighborhood Watch groups in the city from 50 to 487 at last count by using unique recruitment methods. The second goal is to create a network for all watch groups to stay connected with each other and law enforcement. This network will encourage Neighborhood Watch captains to know each other and support each other as well as increase training and information-sharing among the city. Oakland Police Department has done an excellent job in revitalizing Neighborhood Watch in Oakland and the National Sheriffs’ Association presents them with the 2007 Neighborhood Watch Award of Excellence and wishes continued luck building a stronger program. Durham, NC is a diverse city with similar problems facing many cities, but one Neighborhood Watch is working to make their community safer. Several years ago Azalea Park Apartments had serious fire damage due to arson. While the apartments were physically rebuilt, apartment management and the Durham Police Department decided something must be done to improve community spirit. The Azalea Park Neighborhood Watch was started in 2005 and with support of law enforcement, apartment manager Donna Brustad became the Neighborhood Watch Coordinator. The Azalea Park Neighborhood Watch is representative of the diverse population living in the apartment complex. The support of the apartment complex management team has made this superior program possible. The management holds monthly safety meetings on a variety of topics and has made physical improvements to the apartment complex in order to meet crime prevention standards. The numbers prove this Neighborhood Watch program has made a difference to the safety of residents- the number of calls for service has dropped 53% in one year. National Sheriffs’ Association presents the Azalea Park Neighborhood Watch with the 2007 Neighborhood Watch Award of Excellence. Please join us in congratulating these extraordinary groups and their efforts to make the communities better. For more information on the awards process and to apply for the Neighborhood Watch Awards of Excellence please visit the website at www.USAonwatch.org.